BNY Mellon and United Nations Foundation Reveal Investment Opportunities for Closing the Global Gender Gap in "Return on Equality"
DAVOS, Switzerland, Jan. 19, 2017 /PRNewswire/ -- There is significant opportunity for individual investors, asset managers and companies to move closer to achieving the goal of gender equality and make direct social, market and global economic impacts, according to a compelling report launched today by BNY Mellon and the UN Foundation. The report, Return on Equality: Investment Opportunities to Help Close the Global Gender Gap, reveals new insights that underscore the urgency and opportunities for closing the global gender gap and proposes steps investors can take to advance progress towards the United Nations' Sustainable Development Goal 5: "Achieve gender equality and empower all women and girls." "We not only have a moral imperative to bridge the global gender gap, but the potential market benefits and investment opportunities in doing so are pivotal," according to Michael Cole-Fontayn, Executive Vice President, and Chairman of Europe, Middle East and Africa (EMEA). "Companies engaging in 'gender-lens' investing have typically supported women-led businesses and those promoting gender diversity. However, there is an increasing need to focus on the third (and less common) type of investing, in companies that advance gender equality through their products and services." Investors can now pursue these three gender-lens investment strategies through a variety of investment vehicles, including index funds and exchange traded funds (ETFs), venture capital and private equity opportunities, and innovative financing structures, such as private debt vehicles. However, investment vehicles related to products and services that advance gender equality are far and few in between. 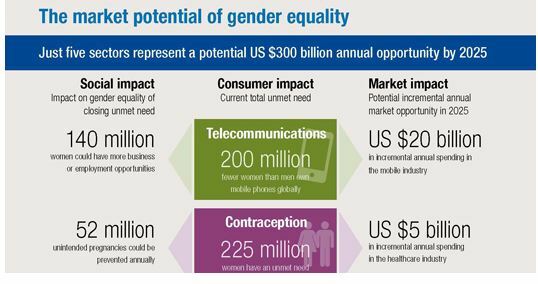 The five sectors examined in this report that present investment opportunities in products and services and further the advancement of women have an estimated market impact nearing U.S. $300 billion alone in incremental annual opportunity globally by 2025. They include telecommunications, contraception, childcare, water and energy. "Achieving global gender equality will require sustained leadership and investment by the public and private sectors and will contribute to the empowerment of women and girls, and have significant positive social, market and economic impact," said Jyoti Chopra, BNY Mellon Global Head of Diversity & Inclusion. "Major barriers to women and girls pursuing economic opportunities are still pervasive and it is our priority to address these issues and improve lives through investing to add value and impact to the global community and economy." Institutional Investors – Incorporate a products-and-services approach into existing gender-lens investing and environmental, social, and governance (ESG) investing strategies. Individual Investors – Shift investments toward companies that offer products and services that support gender equality, focusing on companies that have committed to quantifiable goals or measures. Asset Managers – Create new funds and financial instruments for institutional and individual investors focused on companies offering products and services that support gender equality. "Individuals and companies worldwide reevaluating their current investment strategies to focus on gender-lens investing are taking that first step to contribute to the ambitious goal of achieving gender equality and empowerment for women and girls by 2030," said Heidi DuBois, BNY Mellon Global Head of Corporate Social Responsibility and Social Finance. "Narrowing the gap has major positive ramifications for achieving other sustainable development goals, such as education and health." "The Sustainable Development Goals are designed to lift a billion people out of extreme poverty by 2030, but we won't get there if half the world's population are left on the sidelines," said Ambassador Elizabeth Cousens, Deputy Chief Executive Officer of the United Nations Foundation. "From promoting diversity in their work forces to delivering products and services that empower women, the private sector has a critical role to play - and market gains to accrue - in advancing gender equality." The long-term key to success in achieving a 'Return on Equality' is putting in place the right metrics and an opportunity for third-party assessment. Independent third-party evaluation and certification allows a broader range of companies to participate in the process, reducing competitor concerns, improving comparison, establishing a set benchmark across companies and sectors, and increasing accountability for companies to perform against a standardized set of metrics. The right metrics will keep individuals and businesses on track as they contribute to the goal of achieving gender equality in developed and developing countries alike. BNY Mellon is the corporate brand of The Bank of New York Mellon Corporation (NYSE: BK). As the Investments Company for the World, BNY Mellon holds a responsibility to clients, its people, and the world. Our vision is improving lives through investing— an aspiration that motivates us to maintain the highest standards of client focus, integrity, teamwork, and excellence. Our varied backgrounds, perspectives, and experiences spark fresh thinking, helping us to blaze new paths to progress and deliver profitable returns for our clients and our investors. Most of all, our diversity brings us the dimension we need to shape the future of finance. Together, we can contribute to the resiliency of global markets and solutions for some of the world's most pressing issues, building healthy economies and sustainable communities over time. This release is for informational purposes only. BNY Mellon provides no advice nor recommendation or endorsement with respect to any company or securities. Nothing herein shall be deemed to constitute an offer to sell or a solicitation of an offer to buy securities. Depositary Receipts: Not FDIC, State or Federal Agency Insured; May Lose Value; No Bank, State or Federal Agency Guarantee. BNY Mellon provides no advice nor recommendations or endorsement with respect to any company, security or products based on any index licensed by BNY Mellon, and we make no representation regarding the advisability of investing in the same. The United Nations Foundation builds public-private partnerships to address the world's most pressing problems, and broadens support for the United Nations through advocacy and public outreach. Through innovative campaigns and initiatives, the Foundation connects people, ideas, and resources to help the UN solve global problems. The Foundation was created in 1998 as a U.S. public charity by entrepreneur and philanthropist Ted Turner and now is supported by philanthropic, corporate, government, and individual donors. Learn more at: www.unfoundation.org.